The budget Wacom Intuos will pay for itself in saved time. Wacom’s creative pen tablets help bring a physical, hands-on experience to creating digital art. 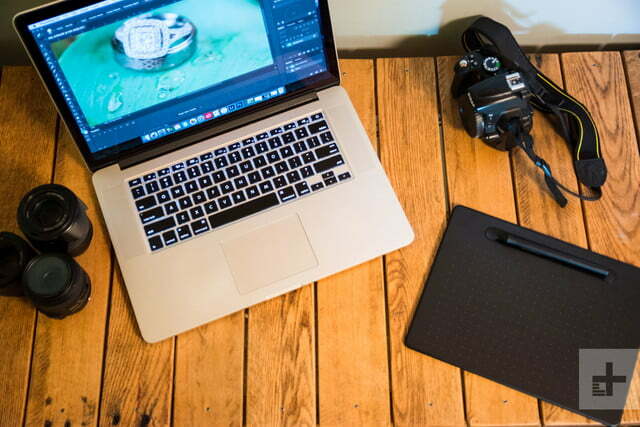 The company is known for its professional tools with accompanying professional grade prices, but Intuos series is designed as an affordable entry to pressure-sensitive control in illustration, design, and photo editing. Priced between $80 and $200, the Wacom Intuos series (not to be confused with the higher-end Intuos Pro line which starts at $250) brings 4,096 levels of pressure-sensitive pen control to more users. 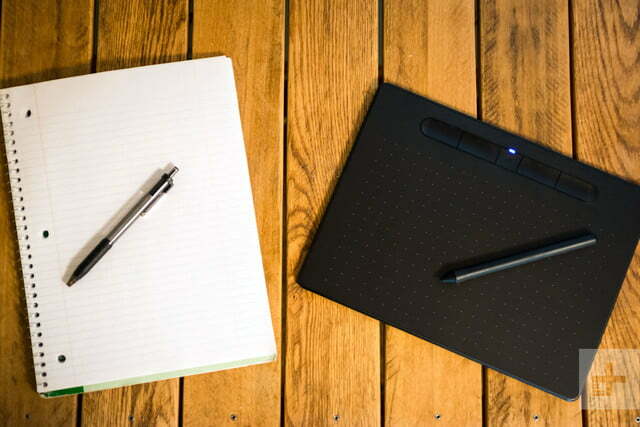 The Intuos comes in two sizes, small or medium, with 7-inch and 10-inch diagonal work surfaces, respectively. The small version is available with or without Bluetooth, while the medium model (tested) includes Bluetooth as standard. As a gateway drug to pressure-sensitive editing and design, it was hard not to get hooked on the Intuos. Here’s how the budget Wacom pen tablet holds up. Unlike Wacom’s flashier Cintiq line of pen displays, the Intuos isn’t itself a screen. The tablet surface corresponds to your computer monitor; moving the pen over the tablet is similar to moving your finger on a trackpad — the movement is in your hands, but your eyes remain forward, looking at the monitor. While it sounds less intuitive than drawing directly on the screen, in practice it feels natural. The majority of the tablet is taken up by that work surface, which measures 8.5 by 5.3 inches on the larger model and 6 by 3.7 inches on the smaller. Above the work surface is a set of five buttons, called Express Keys, which are slightly recessed into the tablet to double as a groove for resting the pen. The middle button powers the tablet on and off and aids in setting up Bluetooth. The remaining four buttons are customizable and can be tailored to control different functions in different apps. As a gateway drug to pressure-sensitive editing and design, it’s hard not to get hooked on the Intuos. The pen feels like a typical writing pen in the hands, down to the similar point at the end. However, it also has two buttons on the side which, like those on the tablet, can be customized. Made from smooth black plastic similar in feel to the keys on a MacBook, the Intuos should look right at home on most desks. Four rubber pads underneath provide grip to hold the tablet steady while you work. While constructed from plastic, the Intuos feels well-built for the price. We did find that with enough use, the pen will leave tiny scratch marks in the surface of the tablet and it is prone to finger smudges. 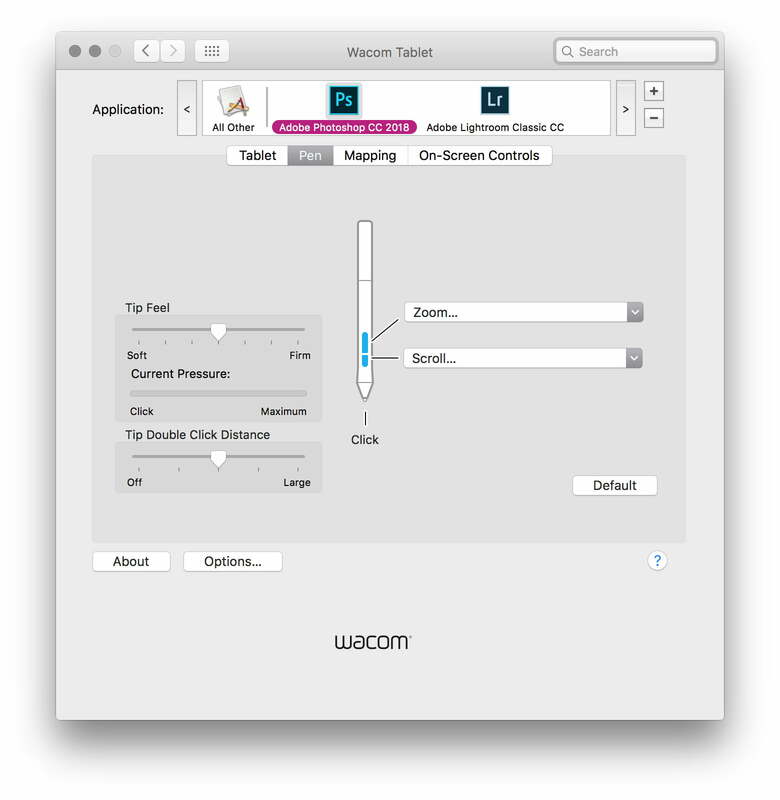 To a computer, the Wacom Intuos is just a fancy mouse — and you can use the Intuos in any program by hovering the pen over the surface and tapping to click. You’ll first need to install Wacom’s software, which allows you to customize the buttons, view battery life, and control other settings. The initial set-up is fairly easy, with on-screen instructions from the software. (We tested the Intuos on a Mac, but the system is also compatible with Windows 7 or later, with the exception of Windows 10 S). Setting up Bluetooth is also painless — after opening the Bluetooth settings and powering up the tablet, the Intuos connected on the first try. Once the Bluetooth is enabled, the only thing the USB cord is needed for is charging. 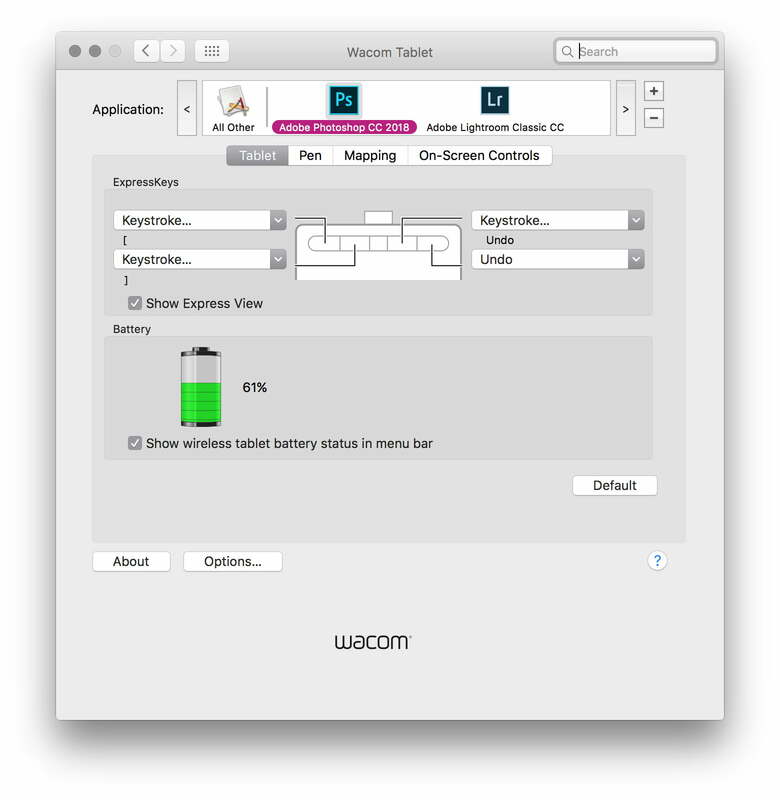 In our experience, battery life was in line with Wacom’s 15-hour specification. (The cheapest Intuos lacks Bluetooth and relies entirely on USB). Pressure sensitivity gives the Intuos its biggest edge over a mouse. While setting up the tablet is easy, configuring the custom settings and finding a setup that meshes with your workflow takes some time and experimentation. The Express Keys on the tablet can be set to types of mouse clicks, navigation (such as scrolling and zooming), and on-screen controls. Probably the most useful custom setting is the ability to assign a keyboard shortcut to a single Express Key. This let you turn the most complicated or commonly used shortcuts in your favorite apps into a single keystroke. The two buttons on the pen offer the same amount of customization. The click and navigation settings allow you to more freely use the pen just like a mouse, with both right click and scroll functionality. You can also alter the sensitivity of the pen tip to make it more comfortable for a lighter or heavier touch. Additional options allow you to choose how to map the table to dual monitors. As Wacom’s budget-friendly option, pen tablet beginners (like this writer) are exactly who the Intuos line is designed for. 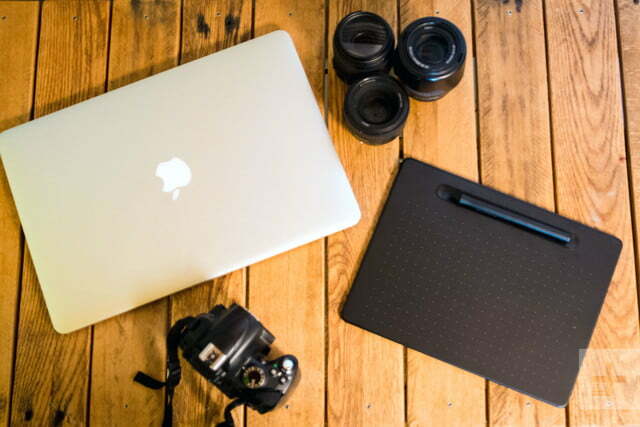 For photographers, the Intuos’ customization options come in hand in Adobe Lightroom and Photoshop. In Lightroom, we set the left two Express Keys to increase and decrease brush size, and the right two to quickly access the healing tool and the local adjustment brush. In Photoshop, we kept the brush size controls healing brush, but swapped the local adjustment brush for the undo command. We left the pen controls as a right click and a scroll to navigate when zoomed in on the photo. Your own setup will likewise depend on the commands you use most frequently. Learning to use the Intuos feels like the first time you tried to type without looking at your hands. Watching the screen instead of your hand while drawing feels strange, at first, but that odd feeling slowly dissipates the more you use the tablet system until it feels just as easy as typing. In fact, using a separate tablet and monitor — versus drawing directly on a screen — may even be an advantage, as your hand doesn’t physically block your view of your digital canvas. The biggest edge the Intuos has over using a mouse is the pressure sensitivity. More pressure creates smaller, darker strokes, while less pressure creates a line as large as the selected brush with more edge gradient. The pen doesn’t mean you never have to choose a brush size, shape, or edge again, but the pressure sensitivity allows you to get that maximum brush size or just a fraction of that selected brush with light pressure. The Intuos will be the biggest time-saver for anyone that does a lot of intricate brushwork. Because of that feature, the Intuos will be the biggest time-saver for anyone that does a lot of intricate brushwork, as it reduces the back-and-forth time in switching between different brushes and transparency settings. While the benefits may not seem quite as obvious to photographers, the dodge and burn tool are also pressure-sensitive, making it easier to create lighter or darker burns over an image by simply adjusting pen pressure. While the Intuos is the most time-efficient when using the pressure sensitivity, the tablet based editing feels more natural for a number of other uses. Using the pen to tap out blemishes with the healing tool was slightly faster than using the mouse, but it also felt more natural and, frankly, helped make a tedious task a bit more enjoyable. The Wacom Intuos is an easy entry into pen and tablet-based photo editing and illustration on a budget. While not as large as pricier options, and serving only as a map of the screen and not an actual screen, the Intuos’ pressure sensitivity simplifies and speeds up many types of brush-based work. We also appreciated how the customizable buttons on both the tablet and the pen create a more efficient workflow. 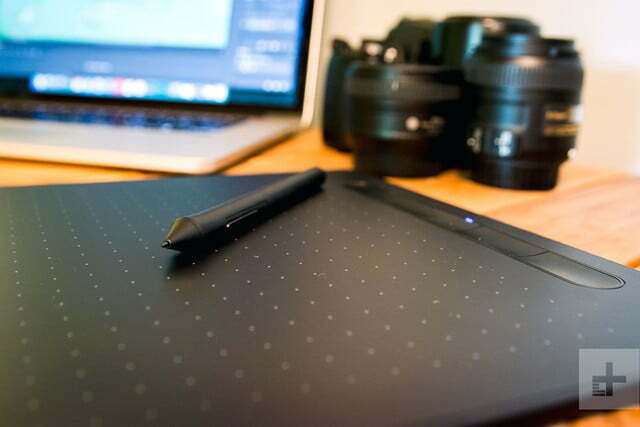 Wacom is to graphics tablets as Adobe is to photo editing — its products are the industry standard. While there are competing pro-level brands, with a price between $80 and $200 on the Intuos, there’s no reason to stray from the top brand. Towards the price range of the larger model, you can find older budget options that use a built-in screen, but with half the pressure sensitivity levels and without Bluetooth connectivity. Within the Intuos line, Wacom offers two sizes, the smaller of which will require more zooming on the screen for working on finer details. Users that will use the tablet solely at a desk and don’t mind cord clutter can save a few bucks on the small, Bluetooth-free option. The larger Intuos M used in this review retails for $200. Users also get access to up to three graphics arts programs. Intuos S buyers can choose one from Corel Painter Essentials 6, Corel AfterShot 3, and Celsys Clip Studio Paint Pro, while Intuos S Bluetooth owners can select two, and Intuos M users receive access to all three. The Wacom Intuos replaces the Wacom Draw, released in 2015 — if the company follows the same release schedule, there won’t be a replacement for another three years. 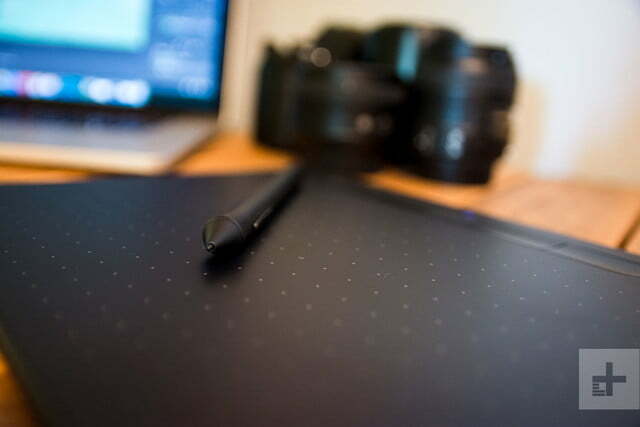 As the industry standard, we fully expect Wacom to support newer versions of Photoshop, Lightroom, and other programs over the Intuos’ lifespan. The construction of the tablet and pen also feels durable, and while we noticed some minor scratching after a few weeks of use, nothing impacted usability. The Wacom Intuos is an easy choice for creatives that do a lot of brush work — buy the Wacom Intuos if you don’t need the extras of the pro-level version but you’re frequently using the paintbrush, pen, eraser, dodge, or burn tools. While the Intuos is helpful and fun for other tasks, like using the clone or healing brush, the time saved may not necessarily recover for the cost of the device. Here, the $80 Intuos S (without Bluetooth) could still be a worthwhile consideration. And if you’re considering one of the $50 bundled programs, the cost essentially drops to $30 for the cheapest version.